Aerospace Floor Panels Market size was valued at over USD 174 million in 2017 and is estimated to exhibit around 4% CAGR from 2018 to 2024. Adoption of methods to reduce aircraft weight and enhance fuel efficiency will drive aerospace floor panels market during forecast period. Flooring units form a major part in aircraft gross weight and require lightweight structures to meet stringent requirements. Honeycomb sandwich panel provides high strength to weight ratio and enhanced stiffness as compared to solid metals. Continuous innovation to provide improved strength & rigidity along with weight reduction trends will influence aerospace floor panels market size. Growing aviation industry owing to rise in air traffic has enhanced domestic and international iterations thereby driving the industry growth. In 2017, the commercial air fleets increased by over 4% to fulfil production lag of over 17,000 aircrafts. Manufacturers are continuously increasing their production capacity to meet previous backlog and is estimated to require over 9 years to reach the target at present fabrication rate. This continuous production will fuel aerospace floor panels market growth from 2018 to 2024. The product enhances the cabin interiors and reduce overall weight to increase overall fuel efficiency. Further, flame resistance and higher durability increases the floor panels adoption. Regulatory including Federal Aviation Administration (FAA), European Aviation Safety Agency (EASA) and International Civil Aviation Organization (ICAO), guides the aviation industry for floor panel utilization in airplanes. FAA requires the passenger compartment interiors to be self-extinguishing to avoid fire spread in case of any fire. The aircraft manufactures need to comply Code of Federal Regulations (CFR) Part-25 for components such as interior surface and structures to ensure flammability, smoke and toxicity requirements. Commercial aerospace floor panels market size will account for over 86% share till 2024 with substantial growth in global aviation industry. Rising disposable income in emerging nations has increased air passenger traffic and led to increase in domestic and international air fleets. In 2018, air passengers have increased by 6% as compared to 2017 and enhanced demand for airliners. Rise in manufacturing of commercial aircrafts including B737, B787 A350 and A320 family will fuel industry growth. Regional jet aerospace floor panels market demand will witness 5.7% CAGR as it provides most cost-efficient air travel. Increment in regional jet series production from companies such as Bombardier to ensure global airline network will support the industry growth. Rising regional jet demand to suffice increasing passenger strength between short haul turbo props and long range single aisle will positively influence product demand. Business aircrafts segment will foresee robust growth particularly in North America and Middle East & Africa owing to high spending capacity in these regions. Nomex honeycomb aerospace floor panels market share will register 2.8% growth from 2018 to 2024 with high demand from commercial airplanes. Further, advantages including lightweight, high stiffness, exceptional strength, good fire and corrosion resistance, thermal stability and exceptional dielectric properties advocates its utilization. These can easily be formed into different shapes and are compatible with most adhesives for sandwich construction thereby enhancing industry growth. Aluminum honeycomb aerospace floor panels market will witness healthy growth owing to high strength to weight ratio. Aluminum imparts optimal safety, strength and longevity to aircraft structures. Non-absorbent property along with 90% recyclability will further enhance the product demand over the forecast timeframe. In addition, these are competitive priced compared to other counterparts. Titanium find application in aircraft cabin structures as it offers maximum corrosion resistance. However, high cost as compared to other materials will limit its growth. 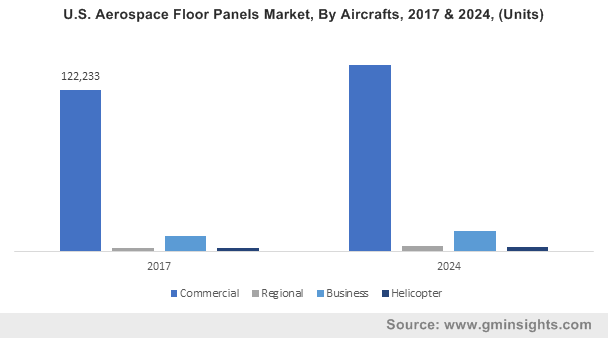 OEM aerospace floor panels market segment will exhibit 2.0% CAGR from 2018 to 2024 with product installation requirement in cabin interiors to meet government regulation for passenger safety and reduce aircraft weight. Industry players are undergoing long term product supply contracts with aircraft manufacturers and are focusing on reducing logistics cost. Increasing demand for regional and commercial aircrafts across regions will support industry growth during projected time span. Aftermarket aerospace floor panels market size will witness strong growth owing to rise in refurbishment and retrofit activities. Airplane interiors need to comply stringent norms regarding fire, smoke and toxicity. Regular compliance with government regulations to ensure passenger safety will boost product consumption in next seven years. North America aerospace floor panels market led by the U.S. accounts for over 55% share and will register 2.2% CAGR owing to presence of large number of aircraft manufacturers including Airbus, Bombardier, Boeing, Cessna Lockheed Martin and Falcon. Rise in large and small sized OEMs for various components will further drive the industry demand. Europe will witness significant growth with continuously increasing air passengers. In 2018, Airport Council International (ACI), Europe recorded a 5% increase in passenger traffic as compared to 2017 further fuelling the market demand during forecast period. Asia Pacific will witness robust growth till 2024 owing to growing aviation industry and rise in retrofit activities in old aircrafts. Commercial Aircraft Corporation of China (COMAC) estimates China share in global aircraft fleet to rise from 15% to 19% till 2036. Latin America and Middle East & Africa aerospace floor panels market is at nascent stage and will witness improvement with growing tourism industry and regional economic expansion. Low air fare in emerging nations in conjunction with increase in business and private jets will further boost industry growth in next seven years. 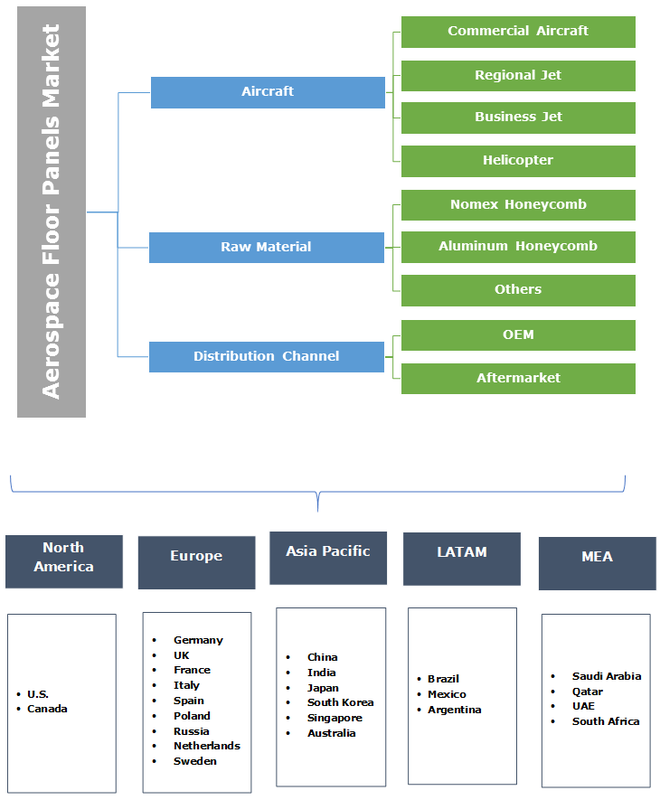 Aerospace floor panels market is consolidated with presence of major players including Rockwell Collins, EFW, Avcorp Corporation, The Gill Corp., Triumph Group, Zodiac Aerospace, Nordam Group, EnCore Group, Aim Altitude, Euro Composites and Advanced Custom Manufacturing. Companies are undergoing business agreements with aircraft manufacturers to enhance the market share. For instance, in May 2018, Rockwell Collins signed five-year agreement with Comlux, a leader in business aviation and completion services to provide avionics, cabin management and galley products in business jets for VIP customers. In addition, Rockwell will provide services for retrofit projects and charter fleets. Aerospace floor panel is preassembled unit with application in aircrafts from cockpit till tail end. These support wall, beams and columns in airplane interior and facilitate need for finished flooring for aircraft body. Rising components cost sufficing the stringent norm and improvement in quality standards may restrict product demand over projected timeframe.